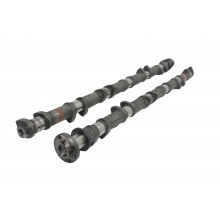 Kelford Cams' range of camshafts to suit Nissan TB48 DOHC engines have proven to be popular for street and sand racing applications in the U.A.E. These cams have been designed and refined through careful research and development with racers and tuners. If you can't find your perfect camshaft within our range, designing custom profiles is our specialty; simply order the custom camshaft and provide us all the details of your build. 264/264 Degrees advertised duration, 9.60mm/9.55mm lift. 286/286 Degrees advertised duration, 10.80mm/10.75mm lift. 308/294 Degrees advertised duration, 12.10mm/11.80mm lift. Custom cams for Nissan TB48 engines..